Regular Show | 'TAIN'T THE MEAT… IT'S THE HUMANITY! I’ve been a fan of JG Quintel’s off-beat cartoon Regular Show since I discovered it while watching the entries from Cartoon Network’s Cartoonstitute new pilot scheme a couple of years ago. The Cartoonstitute project is initiated every couple of years as a means of attracting new talent to the network: animators are given a limited budget and commissioned to create a seven minute cartoon with no editorial interference of any kind. The best cartoons are then optioned as possible series. Regular Show was by far the best of the last batch and it’s now in it’s fourth season (each series consists of forty ten-minute episodes) with a fifth season already commissioned. 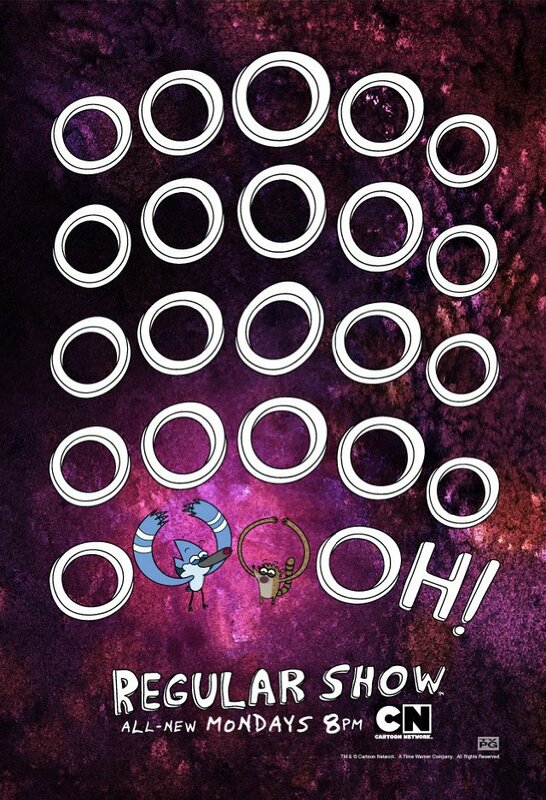 By rights Regular Show really shouldn’t work. Just the cast alone should give one cause for pause: Mordecai and Rigby, a bluejay and racoon respectively, work in a city park under their short-tempered boss Benson, a talking gum-ball machine. Fellow worker Skips is an immortal Yeti from space, while Muscleman, High-Five Ghost (a ghost with a hand sprouting from his head) and the giant-headed and childlike Pops fill out the supporting cast. On a weekly basis Mordecai and Rigby encounter monsters from inter-dimensional rifts, aliens, zombies, psychotic rock and roll singers from the future, the personification of Death (who bears a striking resemblance to Motorhead lead singer and all-round rock god Lemmy), evil computer game characters and even giant space babies. And the world the show inhabits is unashamedly rooted in the Eighties — VHS videos, cartridge computer games and giant mobile phones are the norm. The music the pair listen to is comprised almost entirely of British Hair Rock bands (all with English accents) which they listen to on audio cassette. Despite Regular Show‘s surreal story-lines the characters themselves are surprisingly well grounded and down-to-earth. Mordecai and Rigby are well-meaning but lazy slackers with believable girlfriend and money problems. Benson is essentially lonely and takes his frustration out on the pair. Skips is probably the most sensible and wise probably because he’s ageless, but there’s a sadness that accompanies his immortality. Pops childlike wonder with the world, and his insistence on paying for goods with lollypops, is strangely enduring. 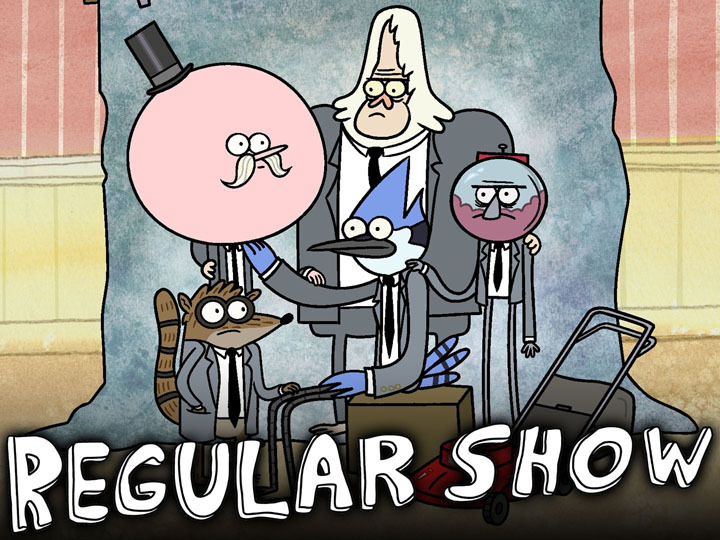 This combination of over-the-top fantasy mixed with realistic characters works well and the writers are clearly enjoying themselves with the opportunities such a show affords: not only is Regular Show one of the funniest shows on TV it’s also one of the most imaginative. A fact that hasn’t escaped the notice of the Academy of Television Arts & Sciences – in 2012 the show won an Emmy for best short cartoon. Unusually for a network cartoon the show features actual songs from established acts – with the exception of The Simpsons and some of the bigger shows, most cartoons won’t spend the money to buy in a song. The episode showing Mordecai and Rigby’s first day on the job – a great pastiche of the opening sequence from Caddyshack – features Kenny Loggins’ I’m Alright, which is also used in the film. Mountain’s 1970 hit Mississippi Queen accompanies a scene where the boys hallucinate after drinking a cocktail of hot sauce and chilli peppers and there’s a memorable episode where Pops sings the whole of Footloose during a fight in a karaoke bar. The remainder of the shows excellent soundtrack is supplied by ex-Devo lead singer Mark Mothersbaugh. Despite being broadcast in the States in an evening slot Regular Show is currently showing on the UK’s Cartoon Network at odd times during the day, mainly at lunchtime and in the late afternoon. I’m not sure why as it clearly isn’t a show aimed at young children. Whatever the reason it’s definitely a cartoon worth seeking out. The latest episode (broadcast in the US last Monday evening) has the boys entering a competition to win a new car by defeating a giant dinosaur made from Limousines – pretty much par for the course for this not-so-regular show.